Description Grapefruit Seeds are the Seeds from Grapefruit (usually administered via a processed extract known as Grapefruit Seed Extract). Digestive System Grapefruit Seed (Extract) helps to prevent and treat Dysentery (by suppressing the replication of the Shigella dysenteriae Bacteria that causes Dysentery). Grapefruit Seed Extract alleviates Flatulence (when the underlying cause of Flatulence is excessive proliferation of Detrimental Bacteria or Detrimental Fungi). Ears Grapefruit Seed Extract (1-3 drops of specifically formulated Ear drops containing GSE applied into the Ear twice per day) alleviates Earaches associated with Otitis: - Grapefruit Seed Extract (1 - 3 drops of specifically formulated Ear drops containing GSE applied into the Ear twice per day) alleviates Earaches associated with Otitis Media (it kills the Haemophilus influenzae Bacteria that is the underlying cause of many cases of Otitis Media). Excretory System Grapefruit Seed Extract (liquid or powder applied topically twice per day) alleviates Body Odor. Grapefruit Seed Extract (liquid or powder applied topically to the feet twice per day) alleviates Foot Odor. 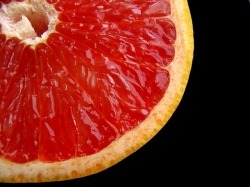 Immune System Grapefruit Seed Extract kills or suppresses many (more than 900) types of Detrimental Microorganisms: - Studies indicate that the antimicrobial activity of Grapefruit Seed Extract occurs in the Cytoplasmic Membrane where the uptake of Amino Acids is prevented and disorganization of the Cytoplasmic Membrane and leakage of low molecular-weight cellular contents occurs. - Bacillus anthracis (possibly - although Grapefruit Seed Extract has not been tested against Bacillus anthracis, some researchers speculate that it may kill Bacillus anthracis on the basis of its known ability to kill other species of Bacillus). - Candida albicans (it is regarded by some as the treatment of choice against Candida albicans proliferation (chronic Candidiasis). - Grapefruit Seed (Extract) is presently under investigation as a potential inhibitor of the HIV virus that causes Acquired Immune Deficiency Syndrome (AIDS). It is also being investigated as a means of treating the various opportunistic (secondary) infections (from Detrimental Bacteria, Fungi, Parasites and Viruses) that occur in conjunction with AIDS. - Grapefruit Seed Extract accelerates the recovery from the Common Cold and minimizes the symptoms of the Common Cold. - Grapefruit Seed Extract (diluted and applied topically to the Lips) accelerates the healing of the lesions (cold sores) and reduces the Pain associated with Herpes Simplex Virus Type 1. Oral ingestion of Grapefruit Seed Extract may also inhibit the Herpes Simplex Virus Type 1. - Grapefruit Seed Extract may suppress the Herpes Zoster Virus.
. Grapefruit Seed Extract is a useful treatment for Measles (it helps to suppress or kill the Measles Virus). Grapefruit Seed Extract is claimed to kill all types of Intestinal Parasites.